Export controls are US laws that regulate the distribution to foreign persons and foreign countries of strategically important commodities, services and information for reasons of foreign policy and national security. An “export” occurs whenever controlled technology, technical data, software, materials, equipment, technical assistance or defense services are disclosed in any medium or manner outside of the United States, or to a foreign person no matter where located. If a defense article, technical data, technology, defense service or software is provided to a foreign person within the U.S. (even on Campus), that action is termed a “deemed” export. The US government has deemed that the provision of the controlled defense article, technical data, technology, defense service or software to the foreign person is the equivalent of providing it to the foreign person’s country of citizenship, permanent residency or in some cases the foreign person’s country of birth. Why is Export Compliance Important? Export control violations can result in penalties and fines which may apply to an individual, the institution or both. Administrative Penalties include loss of export privileges or suspension and debarment from government contracting. Additionally, monetary fines can be up to $1 million per violation and jail time can be up to 20 years per violation. 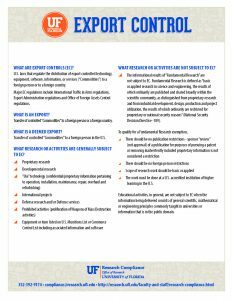 For more information on export controls, contact the Division of Research Compliance and Global Support. The University of Florida (‘UF’) is fully committed to complying with applicable export control laws. To ensure compliance with these laws, UF projects and programs will be managed in accordance with applicable Federal laws, rules and regulations as well as UF policies and procedures including but not limited to the export control related Dean, Director and Department Chair Memoranda (‘DDD’) dated May 19, 2008. As a public institution of higher education, UF employs foreign nationals; collaborates with international partners on research, education and services; and hosts foreign visitors and international students in connection with international exchange programs as well as other academic, research and collaboration agreements. It is the intent of UF to employ foreign nationals, collaborate with foreign nationals and host international visitors, both long and short term, in the most welcoming manner possible while also assuring compliance with U.S. laws and regulations governing the export of certain items (including such items as equipment, software, chemicals, and biological materials) and technical data. Most activities on campus will neither be subject to export controls nor trigger licensing requirements as the majority of university efforts will be eligible for exclusions under the fundamental research exclusion, the publicly available or public domain information exclusion, or the educational exclusion. For those few activities that are not eligible for such protections, each employee is personally responsible for ensuring that appropriate physical and information security safeguards are followed. This may include obtaining an export license from the U.S. government or a determination by the UF Division of Research Compliance and Global Support that an export license exception or exemption is available and documented prior to any activity requiring a license, exemption or exception is taken. Please contact the Division of Research Compliance and Global Support at (352) 392-9174 or at compliance@research.ufl.edu if you have any questions or if further information is needed. 1. DRC can provide a brief overview of Export Controls to individuals or groups interested in obtaining an introduction to the basics of export control. To schedule a presentation of this session at your next departmental or college meeting, please contact DRC at (352) 392-9174. 2. A web-based PowerPoint presentation is available to all UF Faculty, Staff and students (PowerPoint, PDF). 3. Alternatively, if your college, department or lab is planning to work on a project that is subject to export controls, DRC would be willing to present this session to the group involved in the project. Please contact DRC to schedule a session. The US Department of Commerce’s Bureau of Industry and Security (BIS) provides seminars on export controls related to commodities covered by the Export Administration Regulations. A schedule of export control seminars available through BIS is located at the following BIS Online Training Room website. For more information on the courses, including a description of the available sessions, visit the BIS Export Regulations Training Courses website. The Division of Research Compliance and Global Support has provided the following export control compliance tools for the use of the University of Florida Research Community. These are informational tools and are only a starting point in the export control discussion. Please contact the Division of Research Compliance and Global Support directly if you have any questions or concerns regarding specific activities. The Export Controls, Trade Sanctions, and Country Key tool lists each of the country lists contained in the regulations and identifies the specific countries contained in each list. The list is current as of the date last updated. It is recommended that one check the official lists maintained by the US Government in the links provided to ensure that decisions are based on the correct information. The International Activities Checklist (TBD) is an informational tool to be used by the University of Florida community in determining when international travel and/or activities need to be vetted by the Division of Research Compliance and Global Support and or UF International Center. Traveling outside of the United States with equipment, devices, or software, even temporarily, may require a license. To ensure that UF property is not inadvertently exported (temporarily or permanently) outside of the U.S. in violation of the U.S. export control laws, the person traveling with and/or transferring the equipment, device, or software outside of the U.S. needs to comply with the Office of Asset Management Services (AMS) processes for taking UF owned items out of the country. If AMS identifies equipment, devices, or software that may require a license AMS will contact the Division of Research Compliance and Global Support for confirmation and to obtain the license and/or U.S. Government authorization as needed. Shipping of and/or traveling outside the US Shipping with chemicals, biologics and/or nuclear materials (‘Materials’), even temporarily, may require a license. To ensure that Materials are not inadvertently exported (temporarily or permanently) outside of the U.S. in violation of the U.S. export control laws, the person traveling with and/or transferring the Materials outside of the U.S. needs to comply with Environmental Health and Safety (‘EHS’) processes for taking Materials out of the country. If EHS identifies materials that may require a license EHS will contact obtain the license and/or U.S. Government authorization as needed; providing the Division of Research Compliance and Global Support with a copy of the export documentation for the official UF export control file. For more information, please visit the Shipping & Transport of Biological Materials webpage. Recently, there have been a number of occasions where journals, conferences, seminars, etc. have required the University to certify that proposed publications, abstracts, posters, technical reports and other documents developed by University faculty, students and staff are free of ITAR controlled technical data. For the most part the information contained in these documents is the result of fundamental research and is not subject to the ITAR. However, there are instances when the fundamental research exclusion does not apply and a review of the information generated under the project needs to be approved prior to release. When the information is generated under a DoD contract the release of information requirements contained in the DoD agreement must be followed. However, if the information in question was not developed under a DoD agreement, the DoD Office of Security Review (DoDOSR) has been authorized to review and approve for release proposed publications, abstracts, technical reports and other documents that may contain ITAR Technical Data. DoDOSR has published on its website guidelines for submitters who wish to request a security review for a proposed release of information that may contain ITAR Technical Data. For more information please contact DRC at (352) 392-9174 or by email Research Compliance and Global Support. 4. Assisting in license determinations. The Division of Research Compliance and Global Support (DRC) and Asset Management each have a license to use Visual Compliance to assist in export controls compliance at the University of Florida. For more assistance with sponsored research related questions or any of the aforementioned areas, please contact DRC at (352) 392-9174. For assistance with property and equipment related determinations, please contact Marsha White in Asset Management at (352) 392-2329. Export Controls are United States laws that regulate the distribution to foreign nationals and foreign countries of strategically important technology, services and information for reasons of foreign policy and national security. Although there are several export control and/or sanctions related regulations the ones most impacting University of Florida efforts include the International Traffic in Arms Regulations (ITAR), the Export Administration Regulations (EAR), the Department of Energy (DOE) regulations 10 CFR Part 810, the U.S. Nuclear Regulatory Commission (NRC) regulations, and the laws and regulations implemented by Office of Foreign Assets Control (OFAC). Which U.S. Government Agencies are Responsible? The International Traffic in Arms (ITAR) is under the purview of the U.S. Department of State. The ITAR regulates items, information, software, and services that are inherently military in nature. Specifically, Defense Articles, Technical Data and Defense Services are controlled under the ITAR. The Export Administration Regulations (EAR) is under the purview of the U.S. Department of Commerce. The EAR regulates items, information, software and services that are dual use (i.e., predominantly civil applications but may also have military applications) or are strictly civil in nature. Office of Foreign Asset Control (OFAC) is under the purview of the U. S. Department of the Treasury. OFAC regulates financial transactions with, provision of material resources to, activities in and with persons from embargoed/sanctioned countries, persons and entities. OFAC also regulates travel to and within Cuba. 10 CFR Part 810 Assistance to Foreign Atomic Energy Activities (Part 810) is under the purview of the U.S. Department of Energy. Part 810 regulates the involvement of U.S. persons in civil nuclear fuel cycle activities directly or indirectly outside the United States. 10 CFR Part 110 Export and Import of Nuclear Equipment and Materials (Part 110) is under the purview of the Nuclear Regulatory Commission. Part 110 prescribes licensing, enforcement, and rulemaking procedures and criteria, under the Atomic Energy Act, for the import and export of nuclear equipment and materials. What is a “Deemed” Export? Although the term ‘Deemed Export’ is only defined in the EAR the concept also applies to the ITAR and Part 810 regulatory schemes. Under the EAR the release of EAR controlled ‘Technology’ or source code software to a foreign person in the United States is a deemed export. Further Technology is specific information necessary for the ‘Development’, ‘Production’, or ‘Use’ of a commodity subject to the EAR. For the most part a foreign person can have access to and operate equipment identified on the Commerce Control List (CCL). The ITAR, however, has a much broader definition of the ‘Deemed Export’ concept. Under the ITAR access to or provision of ‘Technical Data’ or ‘Defense Services’ as well as access to ‘Defense Articles’ are licensable activities. As such, under most circumstances, a license must be obtained prior to a foreign person obtains access to any information, item, material, or software located on the United States Munitions List (USML). Sanctions are prohibitions on financial transactions with; provision of material resources to; or activities in and with countries, entities or individuals designated by OFAC. Why should I be concerned about an Export? UF employs foreign nationals; collaborates with international partners on research, education and services; and hosts foreign visitors and international students in connection with international exchange programs as well as other academic, research and collaboration agreements. It is the intent of UF to employ foreign nationals, collaborate with foreign nationals and host international visitors, both long and short term, in the most welcoming manner possible while also assuring compliance with U.S. laws and and regulations. Access to restricted or export controlled technology, commodities, defense articles and defense services by an unauthorized foreign person could result in severe criminal or civil penalties for the university and any university employee involved with the export violation. Prosecution of an export violation may result in fines of up to $1M and/or a prison sentence of up to 20 years per violation. A Commodity Jurisdiction (“CJ”) is a determination on whether a project, item, software, information, service, etc. is subject to the International Traffic in Arms Regulations (ITAR) or another set of US Government regulations such as Export Administration Regulations (EAR). It is the responsibility of the person(s) developing the technology, conducting the research, exporting the item, and/or providing technical data/defense services to a non US person to make this determination after reviewing the United States Munitions List (USML) and the relevant sections of the International Traffic in Arms Regulations (ITAR). If after reviewing the USML and relevant sections of the ITAR one is unable to make this self-determination, an official CJ Request should be submitted to the US Department of State (State). Upon receipt State will process the request and make an official determination that will be issued to the requesting party. During the CJ process the item subject to the CJ, whether it is research, an item, information or a service will need to be treated as ITAR controlled with all the appropriate security measures in place. It is always advisable to either make a self-determination or obtain a CJ from State prior to commencing the effort in question so that one does not inadvertently export/release the information, item or provide a defense service in violation of the regulations. What are Limitations of the Fundamental Research Exclusion? The University of Florida is a public institute of higher education whose mission consists of education, research and service. As a large, comprehensive, land-grant, research institution and a US institute of higher education, most research, teaching, or service at the University of Florida will appropriately fall under the fundamental research exclusion, the publicly available/public domain exclusion, the education exclusion or a combination of the three. No publication restrictions have been accepted as part of the associated sponsored research agreement or outside of the sponsored research agreement either verbally or in writing. No foreign national restrictions have been accepted as part of the associated sponsored research agreement or outside of the sponsored research agreement either verbally or in writing. Basic Research is undertaken primarily to acquire new knowledge without any particular application or use in mind. Applied Research is conducted to gain the knowledge or understanding to meet a specific, recognized need. Development is the systematic use of the knowledge or understanding gained from research directed toward the production of useful materials, devices, systems, or methods, including the design and development of prototypes and processes. The research project must be conducted at a US accredited institution of higher learning in the United States.